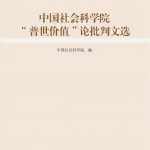 The leadership of the Chinese Academy of Social Sciences (CASS) places the highest degree of importance on the analysis, research, and critique of the current intellectual trend towards historical nihilism, and strives to actively engage in an unyielding struggle against this mistaken historical nihilist trend. Every year, in dealing with the problem of mistaken historical nihilism, my department takes the initiative on official media channels to make use of our willingness to speak out, and our aptitude for speaking out. At the same time, we make use of our full array of theoretical academic publishing and broadcasting platforms (newspapers, journals, websites, conferences and roundtables) to continue to put out a series of critical theoretical essays: This year alone we have completed more than one hundred works on this topic, setting the stage for a large-scale and influential public debate, and confirming our unequivocal opposition to mistaken historical nihilism. Using a critical approach, we have systematically exposed and profoundly explicated the fundamental character, danger, and means of expressing of historical nihilism, while establishing correct historical perspectives and ceaselessly strengthening the freedom of expression and freedom of influence of Marxist ideology and philosophy within the sphere of social science research. We have firmly asserted our right not only to engage in ideological work, but to manage and speak out on the work of others. These efforts have been met with widespread support from academic circles and individuals high and low, earning the overwhelming approval and praise of cadres of every rank. In the struggle against historical nihilism and many other mistaken intellectual trends, the leadership of my department places the highest degree of importance on the cultivation of Marxist ideology for our leading cadres, in addition to the political studies and theoretical ideological education for our researchers and staff. To this end, we have organized annual book clubs for local leading cadres; implemented education courses for management level and above cadres; required ideological studies and Marxist theory composition courses for our entire staff; ideological research think tanks; and Marxist internet armies. These efforts form the basis of a nascent vanguard of Marxist and Party ideological workers. 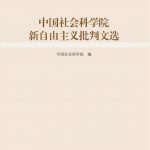 Many of the essays in this collection were written and published by comrades from our organization or professional scholars from affiliated work units; others were composed by external scholars. 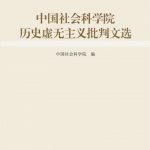 Our goal in editing this book was to help strengthen our cadres’ grasp of historical materialism and make clear the fundamental character and danger of the intellectual trend, dispelling doubts and explaining away confusion, sorting sources, unifying our thinking, and improving our cognitive goals. The actual progress of world history demonstrates that the eventual fate of a given nation or people is largely decided by whatever guiding ideology, social system, or path to development is chosen. Facing a new situation wherein our cultural ideology is undergoing a process of exchange, blending, and confrontation, the paramount task facing the frontlines of philosophical social science is not only to persist in upholding Marxism as our guiding ideology, but to engage in meaningful critiques of “universal values,” the concept of “constitutional democracy,” neoliberalism, historical nihilism, democratic socialism, and other mistaken ideologies from this position. We must place unfailing faith in the path of socialism with Chinese characteristics, matched with an equal degree of faith in our theories, and faith in our systems. After the Cold War ended, operating under the aegis of what the West calls “universal values,” one country after another was toyed with and torn apart, some falling into the flames of war, others to everyday chaos: Afghanistan, Iraq, Syria, Libya, and Yemen are all classic examples. What is clear is that what the system of Western capitalist values brought to these countries was not the “gospel” or “salvation” but instead unmitigated unrest and disaster. The cruel lesson learned by these countries and regions demonstrates that there are no such thing as eternal values which can be universally applied to all societies, all countries, and all peoples. Values have always been a product of the historical conditions of a specific social, economic, and political realities; and every value is specific, historical, transformative, and inseparable from certain socio-economic and political relationships. So-called abstract “universal values,” superseding social class and history alike, cannot independently exist in the real world. The “universal values” advocated by certain individuals contain an implicit political position and definite attempt: they are an ideological trap, aimed at our nation, with the goal of destroying the status of Marxism and replacing it with the ideology of the Western bourgeoisie. 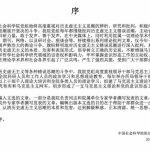 They are a fundamental negation of the leadership of the Chinese Communist Party (CCP), a negation of the guiding status of Marxism, a negation of the state system of the people’s democratic dictatorship, and a negation of the socialist system. The development of the political ideal of “constitutional democracy” accompanied the emergence of Western capitalism, gradually developing into the mainstream political and systematic position of the Western bourgeoisie class. It would not be an exaggeration to say that it defines the national ideology, political mode, and institutional design of Western bourgeoisie. But the “constitutional democracy” they advocate for in reality completely negates our nation’s socialist rule by law, our socialist system, our national system of a people’s democratic dictatorship under the leadership of the CCP, and replaces it with Western capitalist concepts and methods of rule by law, enacting a “tripartite separation of powers,” a “multiparty system,” and a “parliamentary system.” In other words, a capitalist system with a dictatorship of the bourgeoisie. “Constitutional democracy” clearly does not represent some form of “universal democracy” or even a “universal value” because it cannot be used as the system of rule in every county. Our nation is a socialist nation with a specific history and unique realities. What system or methods are appropriate for our nation should be decided by the national circumstances of our nation. Simply copying the political system or political methods of another country would be pointless, and might even have dire consequences for the future of our nation. China is a socialist nation and a developing superpower. We must make use of the beneficial aspects of foreign political civilizations, but never at the cost of abandoning the fundamental political system of socialism with Chinese characteristics. The intellectual trend of neo-liberalism entered our nation during the reform and opening period [of the 1980s]. At its most essential, neo-liberalism is the ideological position of the Western bourgeoisie, representing the core concerns and values of the global economic monopoly of capital. By advocating for complete privatization, total marketization, absolute liberalization, and global unification, it establishes a global arena of an international economic monopoly of capital headed by America. After economists in the Western economic capital monopolies of England and America were won over to neo-liberalism, what was once a purely economic system began to adopt a whole series of policies and behaviors advocating for specific ideological positions, concurrent with the rapid spread of neoliberalism across Latin America, Asia and Africa, and Eastern Europe. In the early 90s, the “side-effects” of neoliberalism first started to become apparent: serious harm was done to the economies of a series of neo-liberal countries, leading to social unrest and unspeakable hardship for the common people. In 2007, the subprime mortgage crisis exploded in America, eventually cascading into a global economic crisis. For the past decade, wanting to kick start their economies while avoiding the developmental difficulties tied to economic deflation, major Western countries beginning with America have found themselves forced to approve ever larger government stimulus packages, infrastructure investments, and other interventionist policies. One might say that the global economic crisis, having its origin in America’s “economic disaster,” announced the complete bankruptcy of neoliberalism. This bankruptcy demonstrates that contemporary capitalism has not fundamentally solved the inherent contradiction which exists between socialized and private production. Periodic economic crises are an unavoidable product of this fundamental contradiction of capitalism. It is precisely because socialist market economics employs a different model, wherein the means of production are held communally, that economic crises are not only avoidable, but also predictable. 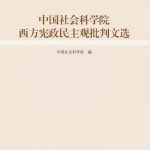 The success of socialism with Chinese characteristics tells us that it is only the close integration of an allocation system based on communal ownership with market economics, making good use of the “visible hand” and “invisible hand,” that can express the true superiority of the socialist system.